The post World War 2 welfare state comprised the NHS; universal housing; state security (benefits); and universal education. According to the late Sir Henry Brooke (HERE), Legal Aid was not a pillar of the welfare state even though law underpins crucial matters such as the NHS structure, rights to medical treatment, housing, welfare, education and the general rights of those charged with criminal offences. Under the Legal Aid and Advice Act 1949 legal aid was to be available in all courts and tribunals where lawyers normally appeared for private clients. Eligibility should be extended to those of “small or moderate means”, and above a free limit there should be a sliding scale of contributions. The Legal Aid, Sentencing and Punishment of Offenders Act 2012 - (LASPO) - brought about major reform of legal aid. The Coalition Government (2010-15) stated in its Programme for Government that it would "carry out a fundamental review of Legal Aid to make it work more efficiently." The coalition's review took place against the background of recovery from the financial crisis which erupted in 2008 - e.g. The Guardian 28 December 2008. Add to that a good dose of political ideology (e.g. - UK Human Rights blog 4 July 2013) and the result is the present day situation where access to justice is, for many, illusory. Legal Aid was a relatively soft target for Ministers - a "sitting duck" as Secret Barrister describes it in Chapter 7 of his best-selling book "Stories of the Law and How It's broken." Reforms were helped along by misleading statements such as "We have the most expensive legal aid system in the world. LASPO abolished the former Legal Services Commission and placed legal aid under the control of a new Legal Aid Agency with a Director of Legal Aid Casework who is a civil servant appointed by the Lord Chancellor. The Agency makes annual reports, the latest being for the year 2017-18 and Statistical Reports are also published - e.g. Jan-Mar 2018. For civil legal aid, the legislation reversed the position where legal aid was available for all civil cases except those specifically excluded by the Access to Justice Act 1999. LASPO removed some types of case from the scope of legal aid funding and, for other cases, provided that they would qualify only when they meet certain criteria. Means testing applies. In criminal matters (as defined by section 14 of the Act), there is provision for Advice and Assistance for individuals in custody (section 13); Advice and Assistance for criminal proceedings (section 15); and representation for criminal proceedings (section 16). Section 17 defines qualification for representation which involves means testing and an interests of justice test. From January 2014, means testing was applied to the Crown Court. LASPO also attacked Defendant's Costs Orders. Some changes to the law have been made since 2012. What is dubbed by some as the "Innocence Tax" works like this. Suppose that James, on the basis of his means, is refused legal aid for representation to defend himself in the Crown Court. He pays for his own lawyer and, at private rates, the cost is considerable. He is acquitted. The system now allows him to claim back his costs but only up to legal aid rates. The costs he has outlaid will far exceed the legal aid rates. The Law Society explains the system HERE. If James' trial was lengthy then he may well find himself acquitted but having to sell his home or other assets to pay for his costs. Serious consequences have arisen since these reforms took effect. As the New Statesman explained on 13 January 2014, some of the most vulnerable people in our society, such as young people in care, the homeless and migrants, are now forced to represent themselves. Also, the number of legal aid providers fell - The Guardian 19 September 2017 - "Ministers have admitted that the number of legal aid providers across England and Wales have been cut by 20% in just five years, removing a lifeline for people facing family break-up, housing problems or challenges with benefits assessments." Legal aid deserts are developing even in areas of law within scope of LASPO - Law Society Gazette 18 April 2016. 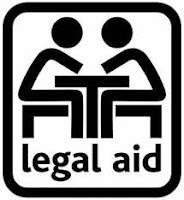 - "Three years after the government scrapped legal aid across swathes of civil law, more ‘advice deserts’ are materialising in the sectors that remain in scope. Several parts of England and Wales now have inadequate housing law cover which could give rise to potential conflicts of interest, it has emerged. A number of areas have no cover at all." Some improvements have been made since LASPO first came into force. For example in Family Law, from January 2018, changes to the rules governing legal aid, specifically the evidence that needs to be provided, means that victims of domestic abuse who qualify financially can access legal aid - as explained at this Family Law Blog. Whilst such changes are welcome, they are "tweaks" to the system and one wonders whether major changes will occur in the future particularly against the background of further - and maybe more difficult - economic uncertainty caused by Brexit. A Post-legislative review was announced in October 2017 - see the Ministry of Justice's very detailed Policy Paper. The Policy Paper was presented to the House of Commons Justice Committee. In September 2017 a Commission led by Lord Willy Bach reported on Access to Justice and made positive suggestions for reform. The report may be read at - The Right to Justice: the Final Report of the Bach Commission. A House of Lords Research Briefing looked at the Commission's report - HERE. A debate on the report took place in the House of Lords on 14 December 2017 - Hansard Online. A number of judicial reviews have concerned access to justice. The government introduced Court and Tribunal Fees which, in some instances, are considerable. In the UNISON case, the Supreme Court ruled that employment tribunal fees were unlawful - Previous post July 2017 and see Supreme Court. The Fees Order* was unlawful under both domestic and EU law because it had the effect of preventing access to justice. Since it had that effect as soon as it was made, it was therefore unlawful and was quashed. The constitutional right of access to the courts is inherent in the rule of law: it is needed to ensure that the laws created by Parliament and the courts are applied and enforced. Tribunals are more than merely the providers of a service which is only of value to those who bring claims before them. As a matter of domestic law, the Fees Order is unlawful if there is a real risk that persons will effectively be prevented from having access to justice, or if the degree of intrusion into access to justice is greater than is justified by the purposes of the Fees Order. The latest case in the High Court is R (Law Society) v Lord Chancellor  EWHC 2094 Admin. This was, in the court's words, "another claim for judicial review of a decision by the Lord Chancellor to reduce the amount of money made available as legal aid for defending people accused of crimes." The challenge was to a decision to reduce fees payable under a scheme called the Litigators' Graduated Fees Scheme under which most of the work done by "litigators" (typically solicitors) in preparing the defence of persons prosecuted in the Crown Court is paid. (There is a parallel scheme for advocates.) The court quashed the Criminal Legal Aid (Remuneration) (Amendment) Regulations 2017. In recent times, the mindset of Ministers has been to bear down as heavily as possible on legal aid. Their action in 2017 to cut fees paid under the Litigators' Graduated Fees Scheme creates doubt that this attitude will change and may become even more entrenched due to economic problems associated with Brexit. The legal aid position is eating away at what the Supreme Court has called the constitutional right of access to the courts. It is eating away at the rule of law itself as the reforms erode rights to legal advice and representation. This risk should no longer be ignored. For the immediate future we are left with little apart from the government's Post-Implementation Review and the hope that it will take action to address the concerns raised by Transform Justice, the Bach Commission, the Commons Justice Committee, and others too numerous to mention here.